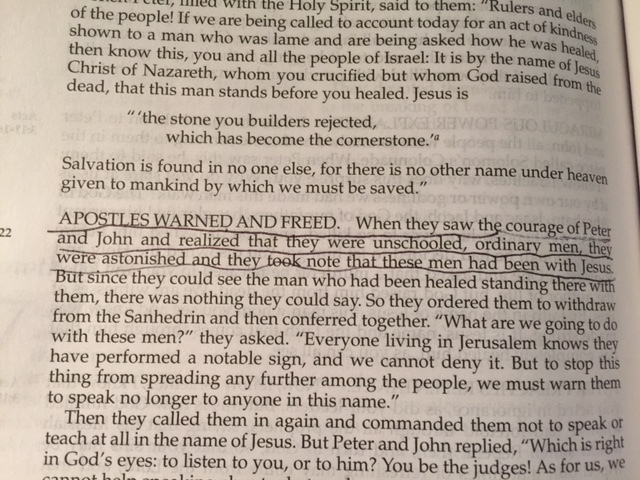 When the Sanhedrin saw the courage of Peter and John and realized they were unschooled, ordinary men, they were astonished and they took note that these men had been with Jesus. Because Peter and John had been with Jesus and Jesus had changed them. * He had redeemed them. * He had given them the power of the Holy Spirit who was now living inside of them. * They now spoke with knowledge and authority. * They had courage beyond that of a normal person. The Sanhedrin didn’t know what to say or do…. so they let Peter and John go with a warning not to speak of Jesus again. Peter and John replied that they were not going to stop talking about what they had seen and heard. Not intimidated by the top dudes. Nothing was going to stop them from sharing what they knew about Jesus. Dear Father, Please help us be as brave and committed as Peter and John was about sharing what we know about Jesus.